They were breathing a huge sigh of relief at North Dean on Saturday evening after Heath won 25-21 away to bottom side Pontefract on Saturday. The faltering visitors had slipped to third from bottom of Yorkshire One but victory put them 10 points ahead of the relegation zone with three rounds of fixtures left. Ex-Halifax RL ace Martin Moana and Imad Nazir were drafted into the team along with Eddie Cartwright and Ryan Hunter. Nazir was quickly into the action with a huge clearance. 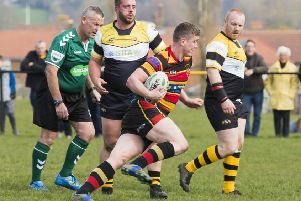 Ian Downsborough put Heath on the attack but the ball was lost and Pontefract’s lightning wingman Jordan Gill ran almost the length of the field to score under the posts. Andy Dean’s kick made it 7–0 after 10 minutes. From the re-start, Pontefract collected but gave away a penalty for crossing. Cartwright, goalkicker in the absence of Ezra Hinchliffe, sent the ball wide. Heath were winning the scrums but had no answer to the Pontefract backs and centre Richard Dedicoat coasted in and the conversion left the visitors in trouble at 14-0 down. It could have got worse - Pontefract broke again for what looked a certain score under the posts but the referee ruled a forward pass. A good clearance from Dom Walsh put the visitors on the attack and Ryan Hunter took the lineout but Heath were offside. Walsh then released Hamish Pratt and Dave Montgomery continued the move. When Pontefract were penalised Cartwright opened Heath’s account after 25 minutes. Excellent scrum control and a pick up by No 8 Downsborough was followed by inter-play between Walsh and flanker Montgomery before the final pass went to Si Brown, who scored an unconverted try. Heath were working hard now, led by captain Mark Puttick with props Chris Piper and Rondene Johnson in support, but the Pontefract defence held firm. Pontefract kicked off down the hill in the second half. Eventually Downsborough and Olly Cook broke free. Heath controlled the next scrum and Downsborough picked up to score. A great conversion from Cartwright put Heath 15-14 up on 48 minutes. Cartwright added a penalty and then made a try-saving tackle at the other end. Nazir went off, prompting a major re-shuffle, and Pontefract regained the lead when a winger’s clever kick inside produced a converted try under the posts to make it 21–18 on the hour. Downsborough stormed through but his pass to Montgomery was adjudged forward with the try-line beckoning. Heath took control at the scrum and camped near the home line. Pontefract’s tackling was tremendous and Heath were denied until, from a scrum, Moana timed a pass to perfection for Montgomery to gallop through. Cartwright converted with seven minutes remaining. Heath’s excellent ball retention denied Pontefract a chance to break out and Piper was one of several Heath players held up over the line late on.